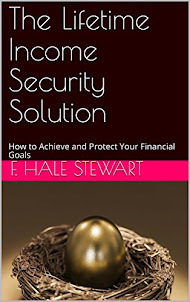 This week's post is up at XE.com. The positive trends keep on keeping on, especially with initial jobless claims. Why Is Anyone Fighting For, Or Giving Money To, American Apparel? The company has a negative book value and a 60% debt/assets ratio. There's been a fair amount of ink spilled on the American Apparel story. One of the primary founders share ownership was diluted, so he devised a plan in conjunction with (I believe) a hedge fund to provide financing. However, here's the question for all the parties involved: why are you interested in investing in this company? 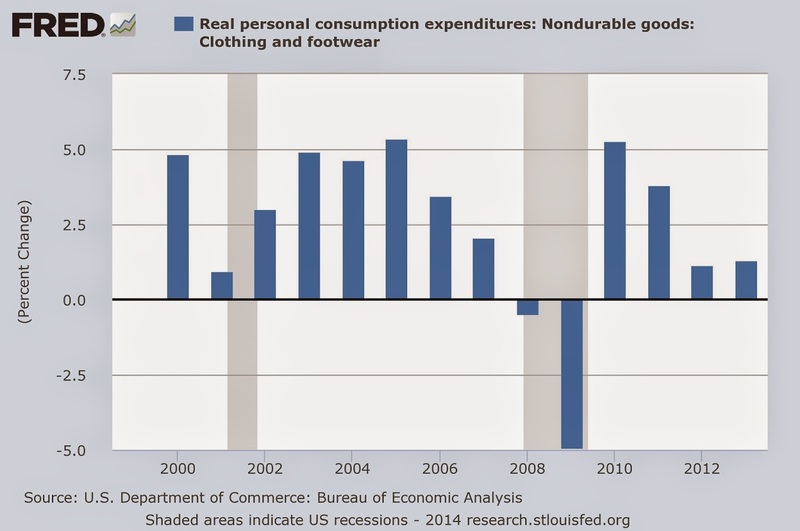 The year over year percentage growth in clothing and footwear expenditures is very weak. 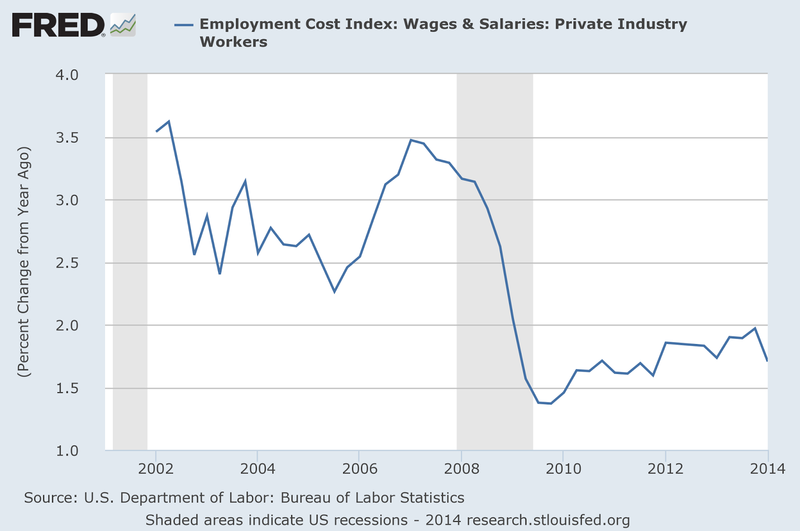 There are numerous reasons for this (weak job growth, weak wage growth and low consumer confidence being primary contributors). But the point is the macro environment is not encouraging. 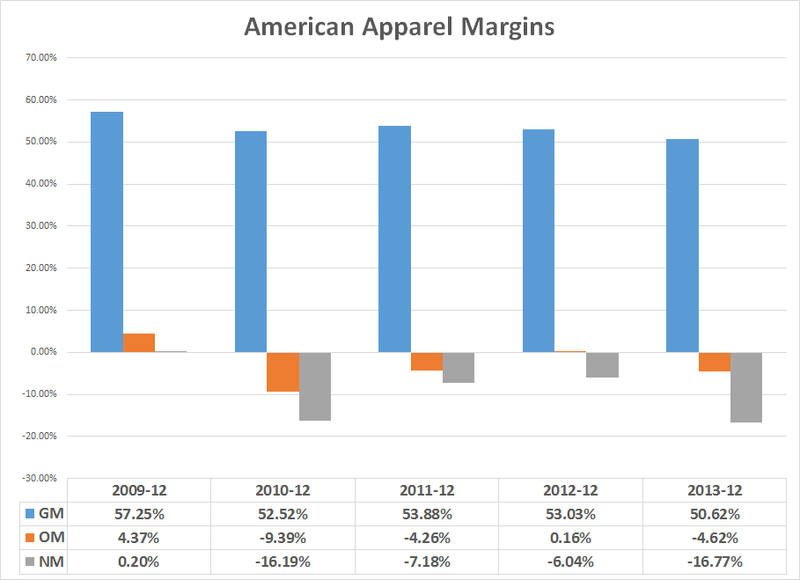 While gross margins are fine, operating and net margins are negative or barely positive. And top line revenue growth has been weak. The best year was 2012 when gross revenue increased 12%. But the 4 year average is 3.39%. And then there's the declining book value. 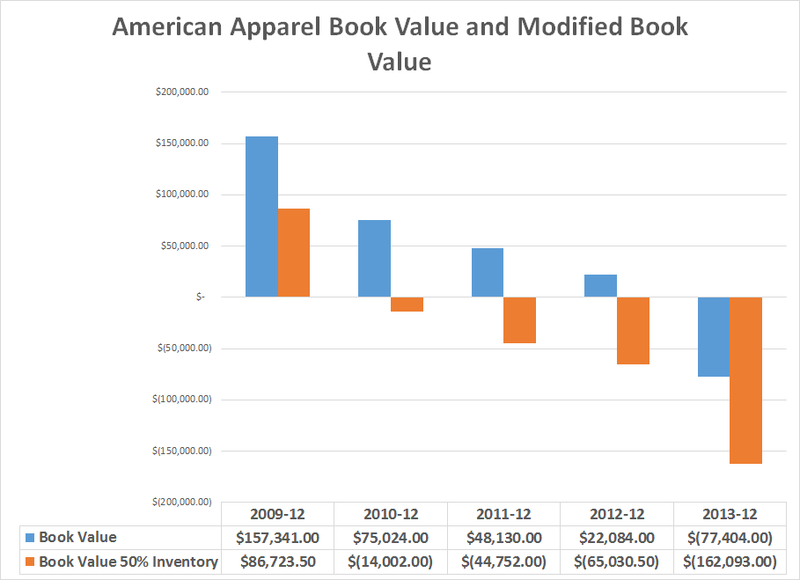 Let's look at two simple measures of book value: pure value (assets-liabilities) and a modified version where I assume inventory is sold at 50% of value. If the company has to be liquidated, the chances are you'll do so at a loss. That means the most logical next step in the event of major problems is bankruptcy court, where no creditor wins. And in the event the company winds up there, you've got a 60% debt/assets ratio with bond holders/lenders most likely holding senior covenants and other legal rights that supersede equity holders claims. So, the company is operating in a weak industry, has slow revenue growth, has negative book value and hasn't made a profit in four years. And, you're got creditors who's loans total 60% of assets, in addition to probably having all sorts of superior claims to equity holders. This is not a good investment -- unless you're looking to short. David Cay Johnston has formally objected to New Deal Democrats post on Friday night. NDD has taken down the post as a courtesy and out of respect for Mr. Johnston and at least until such time as he is able to review and respond as may be appropriate to Mr. Johnston's objections.